In a big bowl, whisk eggs and sugar with a mixer till it gets foamy. Add cream cheese, whipped cream and mix for additional 15 minutes. Cover and leave it in the refrigerator for about 1 hour. Meanwhile, make 1 cup of coffee, dissolving ½-1 tbsp of instant Nescafe in 1 cup of hot water. If desired add some sugar in. Dip lady fingers into the coffee and arrange them side by side over a Pyrex dish. Take the cream mixture out of the fridge and spread half of it over the lady fingers. Then dip the rest of the lady fingers in the coffee and arrange them over. Spread the remaining cream mixture all over evenly. 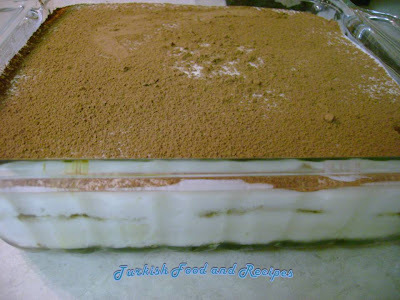 Cover and store the Tiramisu in the refrigerator for about 2 hours. Before serving, cover the surface with cocoa using a small strainer. Yumurta ve sekeri iyice kopurene dek cirpin. Sonra labne/krem peynir ve krem santiyi ilave edip 15 dakika boyunca cirpmaya devam edin. Karisimi buzdolabina koyun ve yaklasik 1 saat kadar bekletin. Bu sirada 1 su bardagi sicak suda yaklasik ½-1 yemek kasigi neskafeyi eritin. Arzu ederseniz seker ilave edebilirsiniz. Kedi dili biskuvilerini kahveye batirip borcam tepsinin dibine yanyana dizin. Dolaptan cikardiginiz kremanin yarisini biskuvilerin uzerine dokun ve esit olarak yayin. Geriye kalan biskuvileri yine kahveye batirip kremanin uzerine dizin. Kalan kremayi dokun ve esit olarak dagitin. Uzerini kapatarak buzdolabinda yaklasik 2 saat bekletin. Servis yapmadan once cay suzgeci ya da kucuk bir elek yardimiyla kakaoyu Tiramisunun uzerine serpistirin. Merhaba tiramisuyu çok severim harika görünüyor ,ellerine sağlık. Do we mix the whip cream when we put the cream cheese?? Yes, you mix the whip cream with the cream cheese.